How does a woman's age impact on her fertility? According to a 2018 study, fewer than half of university students were able to correctly identify the age at which a woman’s fertility declines, and fewer than one in five knew when a man’s fertility declines. The older you get, the lower are your chances of getting pregnant spontaneously, having a miscarriage, and having pregnancy complications. This process begins between a woman's age of 30-35 years. Older and bad quality eggs make getting pregnant more difficult and increase the risk of a miscarriage. The older the woman is, the longer it takes to get pregnant and the less likely it is to have a pregnancy and a baby. Getting pregnant with reproductive technology and IVF, and getting pregnant with an egg donor increases your chances of having a baby. This process becomes more pronounced as a woman reaches 35 years of age. Because of the natural decline in fertility and the increased time it takes to conceive after the age of 35, women over 35 should therefore not wait too long and be referred for infertility work-up after 6 months of trying to get pregnant or earlier if there are known medical issues. Ovarian reserve testing may be considered for women under 35 years of age if there is a good reason. Almost one in ten women, even younger ones, who come in for infertility evaluation have such poor ovarian function that they are extremely unlikely to get pregnant. At the current time, this problem cannot be fixed. Therefore, besides testing his sperm count, assessment of a woman through ovarian reserve testing is among the most important fertility test that a physician does. Women have all the eggs they are ever going to have in their lives before they are born. By the time of woman's birth, the ovarian reserve — the number of remaining eggs stored in the follicles — has already decreased dramatically and it decreases further with each year of life. 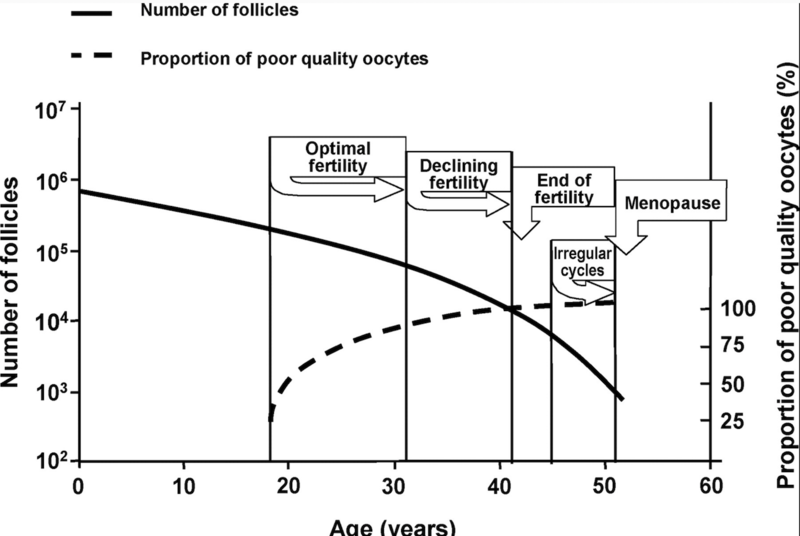 For the rest of her life, ongoing follicular depletion will reduce the number of eggs remaining in the ovaries. In fact, far more eggs will be lost by degeneration than are lost by ovulation. It would be great if there would be a test so women could predict when their eggs will become of so low quality and menopause is close so that pregnancy is close to impossible. Unfortunately, there is presently no adequate test to predict ahead of time when you will go into menopause. Once your eggs are no longer adequate, unless you have already frozen your eggs via in vitro fertilization, the only effective treatment for ovarian aging is egg donation. Pregnancy rates associated with this treatment are also significantly higher than those associated with in vitro fertilization with a woman's own eggs. Yet, no matter what method you use to get pregnant, staying pregnant and going on to deliver a healthy baby is another issue. The risk of spontaneous pregnancy loss and chromosomal abnormalities increases with age as does the risk for concurrent medical conditions such as hypertension and diabetes. Does age affect fertility? Simply put, yes, the age does affect fertility. The older the female is when trying to conceive the more troubles that may be encountered during the process of conception and implantation of the fertilized egg. When a woman is born, she already has the exact number of eggs in her ovaries she will release over the course of her life. The eggs begin to age from the first days of life and begin releasing at the time of the first menstrual cycle. 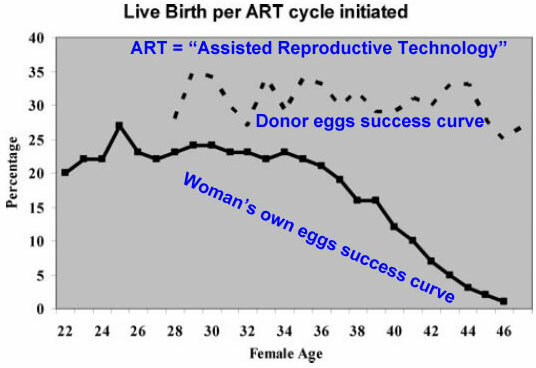 As time moves forward, the eggs age with the woman and often lose the prime ability to fertilize and implant properly. The implantation process involves less of the fertilization aspect of conception and more of the uterine age. The endometrial lining deteriorates as the female ages and thus tends to work less effectively as the woman gets older. The endometrial lining is the place where the fertilized egg will implant and if the lining does not attach the fertilized egg firmly, the implantation may not be a success and thus a miscarriage may occur. Another consideration when trying to conceive in the later years of life are chromosomal abnormalities. The older female is more apt to conceive a child with a chromosome problem than a younger woman. As the hormone levels change with age, ovulation may become sporadic. Ovulation is the time of the month when the female ovaries release the egg ready for fertilization. If ovulation becomes sporadic, the female may have trouble conceiving. The female body was created to conceive children early in life. From the beginning of time, women were married at the age of 14 or younger. The first menstrual period was the signal that she was ready to start a family and carry on the human race. As time passed, societal changes redefined the appropriate age for mothers but the female body did not change. 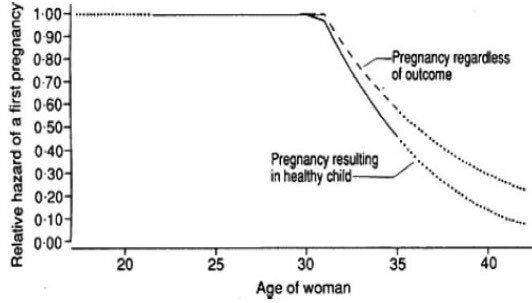 From the age of 20, fertility begins to decline. Once a woman reaches the age of 35, issues with hormonal changes, the age of stored eggs and the efficacy of the endometrial lining will all play a part in the ability to conceive and carry a child. Another huge factor linking the age of the female to fertility problems are health issues and illness. The older the female, the more apt she is to suffer from age-related conditions such as diabetes and high blood pressure. These conditions can all play a huge part in the conception and implantation of a fertilized egg. While the older woman has the ability to conceive, age-related issues may present themselves making it harder for the aging female to become a mother than her younger counterpart. With the advent of fertility drugs and infertility treatments, women are giving birth to children well into their 40’s. Just because the female body is aging does not mean there is no chance of starting a family later in life. Lambalk CB1, van Disseldorp J, de Koning CH, Broekmans FJ. Testing ovarian reserve to predict age at menopause. Maturitas. 2009 Aug 20;63(4):280-91.